It’s a flat carrying case designed for papers (and, more recently, small portable computers) with loop or “basket-style” handles at the top. There is typically only one opening, which runs the whole horizontal length of the top, and the case is usually both long and wide but only an inch or two deep. When you add “utility” to it you start talking about a more casual style. Utility briefcases are designed for practical urban use, and particularly for younger men, and they tend to have a “busier” visual style than the sleek business briefcase. Same basic construction as a dress briefcase.Wide and flat, usually at least 15″ long and 10″ tall, but only 2″ or 3″ deep. Shoulder strap. This is usually the biggest difference — business briefcases of the dressiest style will only have two small loop handles, while a more casual utility briefcase tends to add a removable shoulder strap for messenger-style carry. Durable exterior. Instead of a thin, high-gloss leather, expect something like rawhide or waxed canvas, that can take a beating and keep some wetness off the contents. Zippered opening. Most briefcases don’t have a closure at the opening; the top is always open. A utility briefcase adds a zipper (ideally a lined one, for extra weatherproofing) so that the bag can be fully sealed. Lined interior. Not a necessity, but a plus — many newer utility briefcases now have an extra lining between the contents and the exterior material, adding another layer of weatherproofing and padding more delicate items like laptops. Exterior pockets. Again, an option, but many utility briefcases have small accordion-style pockets on the outside with snap or Velcro closures, adding a place for power cords and other minor supplemental items. What’s A Utility Briefcase Useful For? Older men in particular might balk at the hybrid style of a utlity briefcase: it’s not really dressy enough for a boardroom, and at that point why wouldn’t you just buy a nylon messenger bag? The answer, simply enough, is that less and less business is getting done in a traditional boardroom setting these days. Young men, entrepreneurs and small businessmen, and anyone in a newer industry where the classic business style is viewed as stuffy (basically all software firms, for example) look great when they can carry a briefcase without losing their personal style. Utility briefcases are one of those solutions for the modern professional who needs to be taken seriously in a somewhat counter-culture field. You don’t want to show up with your laptop and documents in a backpack or a nylon messenger bag — that’s a little too counter-culture — but you also don’t want to have a patent leather briefcase banging against your hipster jeans. Enter the utility briefcase. It’s casual, it’s stylish, and it’s still a nod to business culture, making you look like you’re ready to do serious business even though you’re not a “suit.” As an added plus, it’s also a more practical carrying case, since it seals completely and can be slung over the shoulder on longer walks. For a lot of men this is one of the first pieces of luggage you should own — for other men, who already have a nice briefcase or who are in fields with very conservative dress standards it can wait a bit. But for most of us, it’s useful as both a business and a travel piece. It looks vastly better than a backpack, can go with far more styles of dress than a slick business briefcase, and conveys a little more authority and influence than a messenger bag (which is, no matter how stylish a model, ultimately a working-class item that says “I’m a service sector worker” – unlike the briefcase). 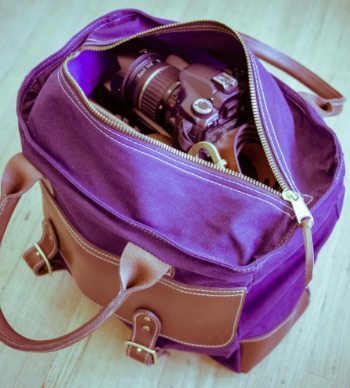 For most men, the two most common uses will be bringing papers and other business items to work and to meetings and bringing a laptop and other small personal items on an airplane. The utility briefcase does both of those well, and won’t ruin your look the way some of the other options will. Again we’ll take a look at one of the offerings from The Blue Claw Co. for an example of good luggage here — this one’s from their “Urban Collection,” a slightly funkier line of products with a busier, younger visual style than the classic luggage. 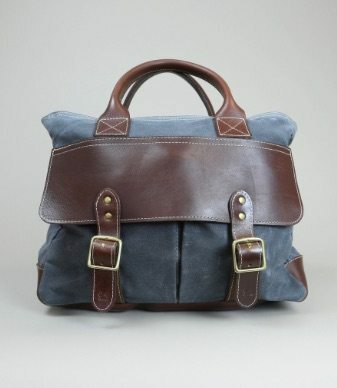 Material: Blue Claw Co. uses waxed canvas, which is tough and sharp-looking but lower-maintenance than leather. It’s also less likely to show casual nicks and scratches, and the 15oz. canvas they use is almost as unlikely to tear as leather. Lining: Thick cotton, for extra interior padding. Handles: The hoop handles are round and made from leather, for more comfortable carrying than squared-off briefcase handles. They’re thick enough that they won’t dig in after a few minutes of carrying, and a little longer than many cases’ handles as well. Shoulder Strap: Leather once again, with thick brass clips to connect it to the bag. The rings where they connect are also brass, held in place by leather straps with brass grommets. Zipper: An oversized YKK with a sturdy toggle and cloth lining. Exterior pockets: A large one runs the whole length of one exterior side, and the other side is divided into two smaller pockets. Plenty of room for accessories. Dimensions: Large enough for a good-sized laptop if needed — their model measures 16″ x 12″ x 3.5″, on the broader end of briefcases. Like all Blue Claw Co. products, it’s made in America. This isn’t the only utility briefcase out there, and you should always do some shopping around on your own, but it’s one that we can safely recommend as a good product and a good example of its type.